A mother has parental responsibility for her child and is generally expected to become the parent with care, in the event of a separation or divorce. Whilst providing care for her child allows her to receive maintenance support from the child’s father, to cover the cost of the child’s expenses, a mother’s rights are very much conditioned by her marital status. 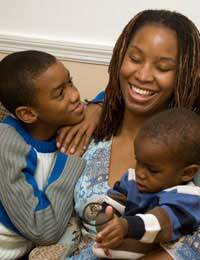 A married woman will be more financially secure, than a woman who remains unmarried, if she has children and her relationship breaks down. If the mother’s name is the only name listed on the child’s birth certificate she has sole Parental Responsibility for the child’s welfare. 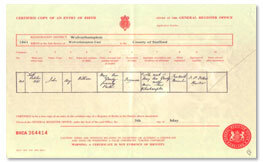 Adding a father’s name to the certificate can only happen if he attends registration. Once the father’s name is registered he will automatically share parental responsibility for the child, assuming that the child is born after 2003. A Parental Responsibility Agreement can be drawn up at a later date if a mother is prepared to share responsibilities with the child’s father, if he was not named on the birth registration form. Our page on What rights does my ex have discusses Parental Responsibility and how to determine it in some detail. Most fathers confirm paternity, when asked, which enables the mother – regardless of the brevity of the couple’s relationship - to apply for child support with relative ease. Establishing fatherhood acknowledges shared responsibility and liability for the child, or children. Those non resident fathers who are less willing to provide maintenance assistance for their child however, can be traced by the Child Support Agency (CSA) and have payment enforced. A single mother is entitled to claim maintenance from her child’s father, on behalf of the child. She does not have to have shared parental responsibilities with him in order to ask for Child Support payments to be calculated and collected from him. Maintenance agreements can be made privately or can be arranged through the Child Support Agency. Without shared Parental Responsibility a father cannot have access to his child without the mother agreeing. He may apply for a Contact Order, if communication between the parents has broken down, and should the father want the child to live with him he will have to apply for a Residence Order. However, the court is unlikely to grant a Residence Order to a father for a baby, as this would give him shared Parental Responsibility. Simply because a father pays maintenance support to the child’s mother periodically it does not mean that he is entitled to see the child. This form of support provides funds to be used towards the cost of raising the child, and should be used to pay for educational and extracurricular activities, shelter, clothing and food. If the mother and the father have been able to agree a figure for maintenance, it is worth getting the agreement agreed by the court, in case payment enforcement is required at a later date. In cases where the mother became pregnant through artificial insemination, or by third party donor, the partner at the time of birth is accountable for the child’s welfare and is expected to contribute financially. To find out how child support is assessed take a look at our page How child support is calculated. Me and my partner have been together for 20 years and have 2 sons aged 13 and 19. The relationship is breaking down. We always argue, with him starting most of them. He always picks fights over the slightest thing. For example: he is very clean and if there is a slight bit of dust anywhere he won't stop going on about it. Now he is arguing about a meal I microwaved which was slightly in too long. Ridiculous. He is working and I am not, so I only have some money my parents gave me recently. He is now saying he doesn't want to be with me as he is fed up, but he is the one always putting me down. I don't talk to my family and he is saying my kids are staying with him. It is breaking my heart. I am feeling so depressed.. I am married but also a single mother at the same time. Me and my husband didn't get the divorce yet but he lives in Slovakia while me and our daughter moved back to the UK. I don't know how much time is it going to take before we get the divorce and my question is: am I classified as a single parent when claiming tax credits? Or do I have to include the husband's income and other things even if we don't even live in the same country anymore? I would appreciate any kind of help or advice, thank you. Hi, I have been divorced since 2015. My daughter has been living with me in Sweden for over five years (her father has very limit contact with her, he doesn't try even). Now, we are about to apply for Swedish citizenship. However, I have got a paper which need her father to sign. I got in touch with him regarding it. He refused to sign the paper. What's our (I and my daughter) right?. Thanks. Son 10 yr old has adhd at the moment his dad only has him 1 night a week. Differently to all the rest i want him to have him more ,i findin things really tough - but is there anything legally i can do to make his dad have him more - shared custody etc . If id have stopped contact there would be help for his rights???? Hi, In August 2017, my ex husband applied to the court to see my son after I sent a letter to home office informing them about our separation. He is using the child contact for his immigration purposes. We had a fact and finding hearing in April 2018 where all the allegations regarding abuse I suffered was approved by the court. In July 2018, he also threatened to kill me while we were in court and the judges approved after a quick fact and finding. On the 14th of September, Cafcass sent a report where they do not approve of direct contact as my ex is too high a risk of harm for me and my1 year old. On the 6th of September 2018, home office issued my ex with a 2.5 year of resident permit. We had another child contact court hearing on the 17th of January 2019 in which my ex did not turn up. So the court dismissed the case and the court approved of the CAFCASS report suggesting no direct contact. It was evident that my ex did not turn up as he already got 2.5 year leave to remain in the country and did not need the child contact case for the time being. So I do not claim anything financially from my ex as maintenance. He only sends 3 gifts per year according to court order. The court order also says that I am allowed to go out abroad for 1 month without asking for permission. This restricts me from having longer holidays. As my ex has no direct contact and does not contribute financially, is there a way that I can get sole parental responsibility as I feel restricted with taking decisions. My partner was deported to Africa because he physically abuse my first son who is now in care. His name is on the birth certificate of my younger son and my younger son and my daughter has been demanding to see their him. They talk on the phone always and they want him back. Please what can I do? Hi I would like to know if there is a law for divorced mothers with 5 year old kid put my hours at work when they suit me! I feel some of my colleagues see it that I benefit more than them because I divorced and I tell my manager the hours I can work and day and also most weekends I am off! The type of work I do need work weekends too! I also feel bad about it! Is any law that I can do that? Hi. my son’s father and i separated whe he was 18 mos. his name is on birt certificate. as a resident parent, can i stop him n my ex’s family contact with my son? what are my rights as a resident parent? Where do I stand if we own a home together and the relationship breaks down? My ex partners parents helped put money down for the house, I will be left with very little. He has a history of mental health and drinking issues, I’m unemployed. Please help. I have recently been to court twice, at the moment the other parent is telling me that he can no longer have contact on the days he wants to have contact., recently she had contact she came to me taking about her private part. Social services got involve. I don't know if a court order is going to say send the child back when the mother is not comfortable with the order anymore. If you cannot agree with your ex or refuse to attend mediation, then your ex can apply to court, please see the link here. As in all cases, the court’s main concern is the welfare of the child in question. The court will always put the child’s best interests first and this main issue will determine the outcome of any application for an order. I have the opposite problem to most. My childs Father and I separated due to his behaviour. He is named on the BC but we we're not married. The opposite problem is that he is very obsessive of our child and visits everyday from 5-7pm since our seperation 4 years ago. I find it extremely stressful as he comes into the home smothers our child with the kind of attention that's very needy and disabling & doesn't parent in an enabling wah. He emotionally neglected me and refuses to communicate with at all, thus setting a terrible role to my son. When I suggest he changes the times he out right refuses and says he already hardly sees him. It is exhausting for our child to entertain him for that length of time everyday but the Father refuses to acknowledge that.Our Son is 5 and likes seeing him but wants me around for the parenting. Also if I left them, I'd never have any quality time myself. As our child goes to school he comes when I'm trying to get on with dinner, bath homework for school etc and it really interferes with those timings.What are my rights regarding saying it's to much as our time is being dictated by him? I have no quality of life and I feel I'm being totally controlled even though separated. Mediation may be an option for you to consider in order to arrange set times. You don't say whether your ex has time away from your home with your child. If not, perhaps this should be encouraged i.e to take him from 5-7pm several times per week. I have the opposite problem to most. My childs Father and I separated due to his behaviour. He is named on the BC but we we're not married. The opposite problem is that he is very obsessive of our child and visits everyday from 5-7pm since our seperation 4 years ago. I find it extremely stressful as he comes into the home smothers our child with the kind of attention that's very needy and disabling & doesn't parent in an enabling wah. He emotionally neglected me and refuses to communicate with at all, thus setting a terrible role to my son. When I suggest he changes the times he out right refuses and says he already hardly sees him. . It is exhausting for our child to entertain him for that length of time everyday but the Father refuses to acknowledge that. Our Son is 5 and likes seeing him but wants me around for the parenting. Also if I left them, I'd never have any quality time myself. As our child goes to school he comes when I'm trying to get on with dinner, bath homework for school etc and it really interferes with those timings. What are my rights regarding saying it's to much as our time is being dictated by him? I have no quality of life and I feel I'm being totally controlled even though separated. Hi my sons dad was in contact with him and use to see him until my son had an op. His parents dad passed away when he was meant to come visit his son he let his son down and he didnt care that his son had to go back to hospital he hasnt tried to call to see how he got on or anythink. What are my rights as I dont wanna let him see his son after what he has done. If you stop access, then please see the link here which shows the process if your child's father does not agree. Hi, my marriage is breaking down due to my husbands behavior. I’m living here on spouse visa but my child is British through him. He wants me to leave so he can be free from all his responsibilities & said he will not pay me or my child for anything & he will cancel my visa. He has made me spend all my savings by emotional blackmail & now that I have no savings left he’s trying to get rid of me ASAP by abusing me verbally & emotionally. 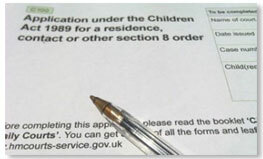 I want to know my legal Rights & what am I entitled too if I continue living in the UK as a single parent? You would have to inform the Home Office is you separate, please see link here , in which case you may be asked to leave the country or apply for another visa. Hi, my marriage is breaking down due to my husbands behavior. I’m living here on spouse visa but my child is British through him. He wants me to leave so he can be free from all his responsibilities & said he will not pay me or my child for anything & he will cancel my visa.He has made me spend all my savings by emotional blackmail & now that I have no savings left he’s trying to get rid of me ASAP by abusing me verbally & emotionally. I want to know my legal Rights & what am I entitled too if I continue living in the UK as a single parent? Hi. I've been married but separated for years and neither of us have started divorce proceedings. My ex lives abroad and we don't have much contact. Now I'm 6 month pregnant with another guy's baby with whom I'm no longer in a relationship - I only found out he was married after I got pregnant. He wants to be involved though, physically as well as financially. He wants to be on the baby's birth certificate as well as having both of our names hyphenated for the child and as despite of circumstances we're still friendly and dealing with the situation as adults, I'm okay with that. Now, would we have any issues having his name on the birth certificate, knowing that legally I'm still married to someone else? Ive just move with my partner when I found out I’m pregnant and he was very happy and helpful for few weeks. After I start being very sick and couldn’t move from the bed so I stop working. Now I’m 16 weeks pregnant and the relation changed completely. He pay rent but live in his own. Never speak with me or stay together in the same room. He told me is not ready for family and all this situation is stressing him. I feel sad and I don’t want to go further with the relation. My question is what’s my rights as a single mum because I have no intention to put him on my baby certificate? How I’m going to afford all the expenses? Is there any help single mums can apply? The flat we live is just under my name. How I’m gonna do everything? I have just 3 years in London so I don’t know what to do. If your partner's ex has parental responsibility of the children (regardless of whether he sees them), then by law your partner has to request his consent. If he refuses, or refuses to discuss the matter via mediation then your partner can apply to court for permission. It is highly likely the court wouldn't refuse, especially if your partner's ex has no input into the children's lives. Your partner could risk making the move without consent and if the father wishes to challenge the matter, he would have the option to apply to court. However,if he has no input into the children's lives by choice, then it is highly unlikely a court would force your partner to return. Hi myself and partner have recently broke up and have a 2year old son who I primarily look after. My partner is demanding to have him 3 times a week but I am saying it will be two days a week - am I in my rights to do this as I am not stopping contact just saying 2 instead of 3 until a court order is in process. Thank you in advance. If your ex has joint parental responsibility, you both have joint rights on deciding what you both think is in your child's best interests. If you cannot agree, then your next option is to consider attending mediation in order to come to an agreement this way. Mediation is when two or more parties meet to resolve problems before the matter reaches court. It is most often used in family proceedings, contact orders, residence agreements and divorce. It is a formal negotiation and courts can accept the agreement of the mediation instead of having to go through the court process, although it is subject to final court approval. Mediation takes place in front of a neutral third party. The mediator has no pre-conceptions and will not force you to make an agreement. They will assist the two parties in taking turns in the conversation, and help you reach a decision that you are ready to agree with. Mediators do not pass judgment or offer guidance; they are there, in effect, to facilitate conversation between the two sides. Your partner or you will not be able to apply to court unless agreement has been considered, or attempted, please see link here. If the matter goes to court, the decision will be out of your hands and given over to a judge to decide which may or may not work in your favour. Agreement between both parents is always best, as both of you theoretically have equal rights to care for your child. Can a court enforce a father to have their child after they have periodically over months not show up and left the child distraught as a result ? A court would never 'force' an unwilling non-resident parent to have their child. As in all cases, the court’s main concern is the welfare of the child in question. The court will always put the child’s best interests first and this main issue will determine the outcome of any application for an order. You can see more via the link here , which will tell you, that you need both parents with PR to consent to any change of name by Deed Poll.